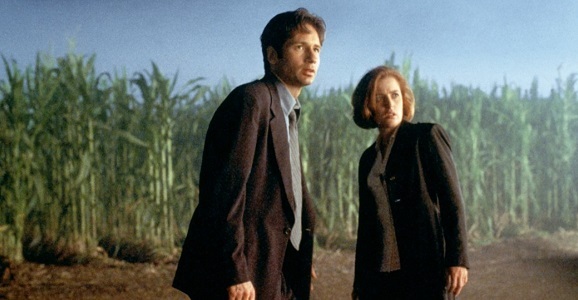 Ever since Fox Television Group head Gary Newman said that they’ve been kicking around ideas for more X-Files at the Television Critics Association winter press tour recently, there’s been a ton of chatter about a possible revamp. One question is how original stars Gillian Anderson and David Duchovny feel about returning to their most recognizable roles, and as it turns out, at least one of them feels pretty damn good about the prospect. On Tuesday, USA Today caught up with Duchovny and asked him about the potential for an X-Files revival. He said he would be both “happy” and “excited” to bring the paranoid sci-fi classic back to the airwaves. In addition, he also offered a glimpse of what it could look like in terms of size and scope. If this does materialize, it likely won’t be as a regular continuing series. I’m assuming that it will happen sooner rather than later now. We’ll see what form, how many (episodes). Certainly I can’t nor would I be interested in doing a full season. It will be in some kind of limited form. We’re all old, we don’t have the energy for a full season. A limited run makes sense. Both Anderson and Duchovny are busy in other realms, and this sort of limited, event-style series has become a popular strategy in broadcasting these days. With a truncated run, it also provides more contained, cinematic format for storytelling. You don’t have to worry about filling 22 or 24 episodes and can have a more streamlined narrative. And as much as I love the X-Files, it did have a tendency to ramble on as the conspiracy kept spooling out. A shorter series could rein some of that in, not to mention that Fox had success in this arena with the latest run of 24. Duchovny just wrapped up a seven-year run on Showtime’s Californication, while Anderson has a regularly recurring role on NBC’s Hannibal, stars in BBC’s The Fall, and is working on the period crime drama Aquarius for NBC. They have both reprised their iconic roles for two X-Files movies, and if Kyle MacLachlan can revisit his famous FBI agent role in Twin Peaks years after the fact, why can’t they? Aside from the stars, the other key component to the X-Files is creator, producer, and writer Chris Carter. We’ve heard that he has been talking to Fox about working on a new run—this is a subject that has come up from time to time over the years—and now that Amazon is not moving forward with his series The After, maybe that frees him up to focus on getting this done. This is all just talk at the moment, but X-Files fans have to be excited about the prospect of getting the gang back together. Are you in for more, do you still believe? Or do you wish they’d just leave well enough alone? they mentioned the X-Files unit in Fringe… hmmm, perhaps a crossing of streams? Sweet. Now that all the old shows are returning is some way or another, why not bring back Seinfeld while their at it.